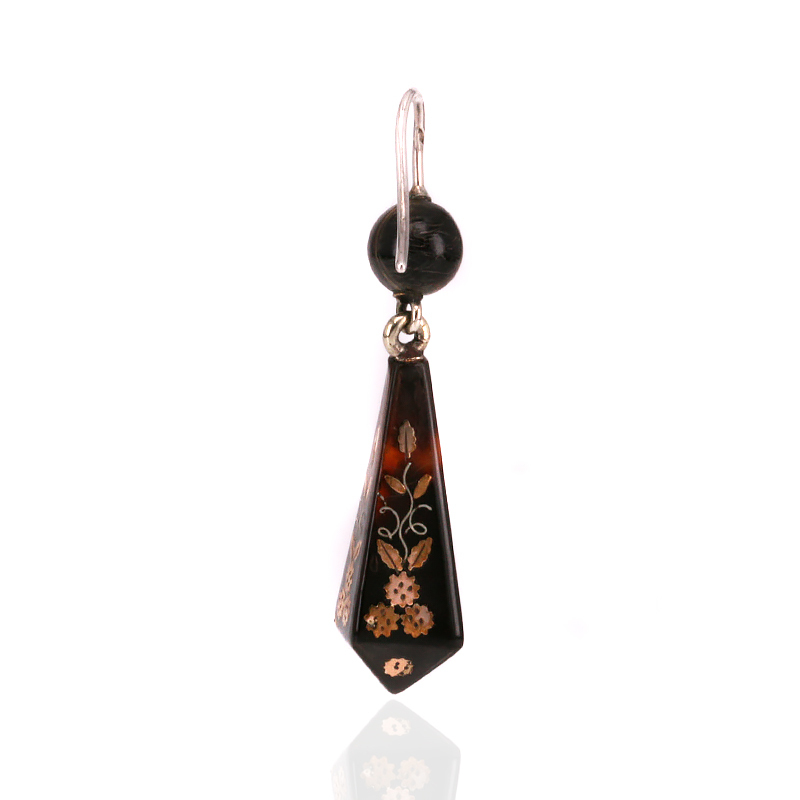 Product code: ES8020 Categories: Sold Items, Sold earrings. These particular pique earrings date from the Victorian era and have the most elegant drop shape that is inlayed with such a fine and highly detailed pattern that leads up to the ball shaped pique at the top with a star pattern. Measuring 42.2mm in length, these are the perfect size to wear during the day and well into the night and are perfect with any outfit and occasion. Antique pique jewellery has always be popular and when these are adorning your ears it will be so easy to see why. Tag: Antique pique drop earrings. Piqué jewellery is a style and type of jewellery all unto itself and one that cannot be reproduced today and is so unique and spectacular. Made most popular during the Victorian era, it can be found as far back as the 18th Century and was popular throughout most parts of Europe but mostly in Italy and England. Piqué (pronounced “pee-kay”) is gold or silver – or sometimes a combination of both, inlayed into another material. Quite often the material was tortoiseshell (from the Hawksbill tortoise which was also used for the making of other tortoiseshell material such as boxes etc) and sometimes even from elephant ivory. The tortoiseshell seemed to be the most popular, probably because of its light weight and being easy to “mould” into other shapes. Tortoiseshell is a natural thermoplastic , meaning that it is quite malleable when heated/warmed. Very fine gold or silver would be fashioned into either fine “rods” or “leaf” designs and the pressed into the already warmed tortoiseshell.After the gold and silver was set, the shell was left to cool down which would then contract to hold the metal in place. Prior to 1870, the metals were cut by hand allowing for very fine and intricate detail then after 1870, machines started to do the work resulting in more straight and angular designs. The attention to detail no matter the age is always something that never ceases to amaze people especially when you consider that these pieces were often made well over 140 years ago and still look superb today. Piqué jewellery can most commonly be found in earrings and pendants, and the designs and colouring are amazing to admire. This form of jewellery making is now a lost art as both the elephant and Hawksbill turtle are protected species, meaning that piqué jewellery will become harder and harder to find as the years go by.